A standard IX Water module containing MetalClear, OrganiClear, and MetalClear++. 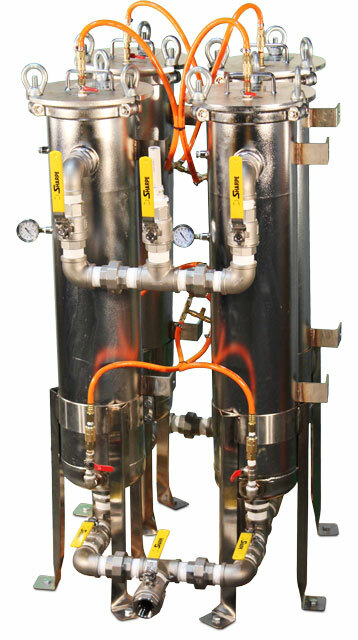 Description: PartiClear filters out any particles, oil, and grease remaining from the customer oil recovery process. PartiClear is a 304 stainless steel canister with a replaceable filter and is designed to protect subsequent media from fouling. Contaminants: Aluminum, antimony, beryllium, cadmium, chromium, copper, iron, lead, manganese, mercury, nickel, thallium, zinc, etc. Description: MetalClear™ is a IX Water product for the elimination of a variety of metals commonly found in produced water. The system employs one of IX Water’s specialty formulated ion exchange medias to affect metals removal: IxMZ-S. This media was specifically designed and selected to meet the needs of the oil industry: long lasting, low cost, and highly durable. 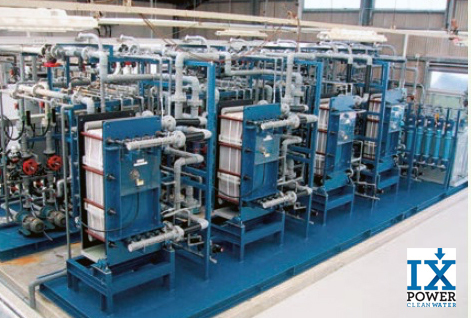 The system itself is very low power, requiring only a feed pump, operates at ambient pressure, and is on-site regenerable with NaCl (table salt) or waste brine from a subsequent salt removal process. **Targeted metals include: Aluminum, Antimony, Arsenic, Beryllium, Cadmium, Chromium, Copper, Iron, Lead, Manganese, Mercury, Nickel, Thallium, Uranium, and Zinc. (VOCs and SVOCs), BTEX (e.g. benzene, toluene, ethylbenzene & xylenes), arsenic, etc. Description: IX Water OrganiClear™ is the result of over a decade of research and development at the world’s premier energy laboratory. For the first time ever, a completely reliable and cost efficient solution is available for the elimination of dissolved organics, VOCs, and BTEX in oil & gas produced water. OrganiClear uses a proprietary, all natural, adsorption media called IxMZ, which is reusable for months to a year of operation, and recharges with nothing more than ambient air. OrganiClear was specifically designed to eliminate organics from produced water, has a low capital cost, is completely effective, integrates with new or existing treatments trains, and costs less than any other dissolved organics treatment. Contaminants: Scalants including magnesium, calcium, strontium, barium, etc. Description: IX Power Clean Water’s MetalClear ++™ machine combines MetalClear’s ability to remove heavy metals, with additional technology to remove the alkaline earth metals, which commonly cause scale problems. Systems can be designed to effect removal rates of up to 100%. The system employs a combination of IX Water’s specialty formulated ion exchange medias (IxMZ++), to effect metals and scalant removal concurrently. This media was specifically designed and selected to meet the needs of the oil industry; long lasting, low cost, and highly durable. The system itself is very low power, requiring only a feed pump, operates at ambient pressure, and is on-site regenerable with NaCl (table salt), or waste brine from a subsequent salt removal process. Typical configuration includes one MetalClear++ reactor paired with each OrganiClear module. Regeneration is affected through circulation of brine over a several hour period, seamlessly fitting into OrganiClear’s regeneration schedule, though required less frequently. Depending on regeneration technique, high metal waste brine may be held to a volume of less than 1/100th of flow volume. This waste can be safely disposed of along with reject brine from the sites salt removal process, or evaporated and disposed of as solid waste. **Targeted species include: magnesium, calcium, strontium, and barium. Description: SaltClear™ is IX Power Clean Water product for the reduction and removal of TDS from brine. 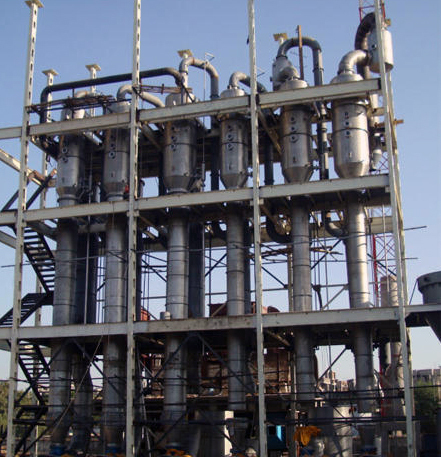 The system is a custom designed vertically stacked tube multi effect distillation system. SaltClear is well suited to varying levels of TDS, can except all types of water chemistry makeup, and uses significantly less power than similar systems (.48 kWh/bbl). SaltClear is a robust system with a lifecycle in the range of 20 years, that requires shutdown and maintenance only once per year, and requires a lower level of operator skill than similar membrane plants. Description: SulfurClear™ is a water purification technology designed for the elimination of H2S, mercaptans, and odor causing bacteria. The process exposes feed water to a strong oxidizing agent chemically bound to an inert substrate. Substrates include natural zeolites and synthetic polymers and are chosen to best meet the customer’s needs. The oxidizing media may be recharged on site using a sodium hypochlorite solution at concentrations similar to household bleach. SaltClear™ ED (above) can be matched with a multi-effect evaporator (MEE), right to create a Zero Liquid Discharge (ZLD) system. IX Water products leverage re-usable (field rechargeable) media and OTS mechanical components to insure completely effective treatment at the lowest cost to your and teh plante. IX Water tech was invented via a unique collaboration between staff at Los Alamos Natioanl Laorty, the Univesrity of Texas, and New Mexico Tech. The IX Power team (IX-FORCE!) has worked together for decades to bring advanced science and technology to solve safe power and clean water issues.